England utility back Mike Catt was born in Port Elizabeth, South Africa and played for Eastern Province as a student. Catt, whose mother was English, joined Bath in 1992 as understudy to England fly-half Stuart Barnes. He made his debut against Northampton at age 21. 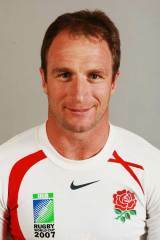 Catt's England debut came in 1994 against Wales, as a replacement for fly-half Rob Andrew, but he came to international prominence as a fullback. Indeed, Catt's international career took in caps at fly-half, fullback, centre and wing. He starred at fullback during England's 1995 Grand Slam before being selected for the World Cup in South Africa later that year. Catt's most memorable contribution at the World Cup was to be unceremoniously trampled by a rampaging Jonah Lomu during the semi-final match against New Zealand. Catt made one Test appearance for the British and Irish Lions in 1997, starting the third Test at fly-half. He was also selected for England's 1999 World Cup squad as they crashed out in the quarter-finals. Catt moved into the centre following the 1999 tournament, and outside Jonny Wilkinson found a new vein of form. He was selected for his second Lions tour in 2001, but injury meant that he was replaced by Wales centre Scott Gibbs. Catt's finest moment in an England shirt came in 2003, when he was part of the side that won the World Cup in Sydney. Catt made a replacement appearance in the final after starting the semi-final win over France at inside-centre. Following the end of the 2003-04 season Catt's contract with Bath was not renewed, and he subsequently moved to London Irish. Catt enjoyed a renaissance with the Exiles, going on to be named Guinness Premiership Player of the Season in 2005-06, and he became the oldest player to play in a World Cup final when he lined up against South Africa in 2007. In the aftermath of the tournament Catt caused controversy with criticism levelled at the England management in his autobiography. Following the departure of Brian Smith to the England setup, Catt took over duties as London Irish attack coach in the 2008-09 season and finally decided to hang up his boots at the end of the 2009-10 season to concentrate on his coaching career. Awarded an MBE in the wake of England's 2003 World Cup triumph, he received an OBE in the New Year Honours list at the end of 2010. Catt helped herald through numerous backs for London Irish including Jonathan Joseph but failed to guide the Exiles to silverware. With Smith returning to the London Irish set-up it was announced in April 2012 that Catt would leave the club. On the same day, the Rugby Football Union announced that Catt would join England on their tour of South Africa as interim backs coach with Wayne Smith and Andy Farrell both turning down the role.